In the first post of this series it was made clear that these posts would come at random points with no particular structure or length of time in mind. Given there is a Christmas based product included in the foods mentioned below it made sense to share it sooner rather than later but also there have been a number of interesting bites come along recently that deserve an honourable mention. The smell of gingerbread is enough to scream Christmas as the scents of ginger, nutmeg and cinnamon bring back memories of making Christmas cakes or attempting to make good quality mince pies. The idea of gingerbread provides images of gingerbread houses covered in sweets, edible glitter and surrounded by whimsical edible garden decor. 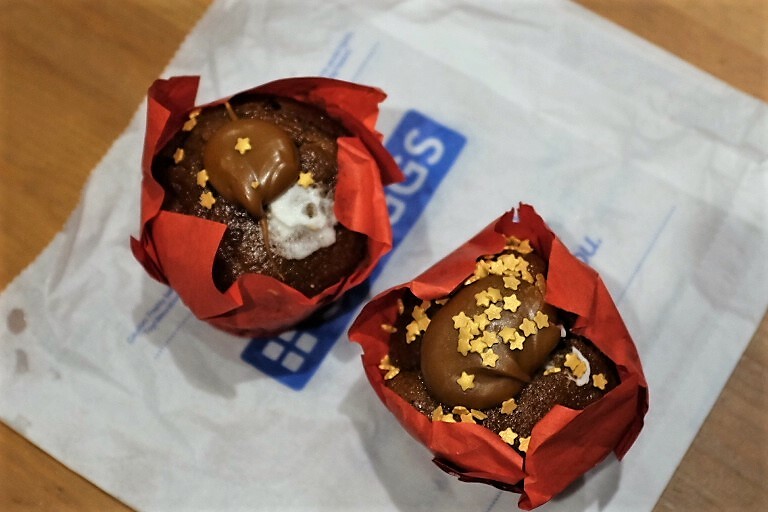 With the gold stars, overflowing chocolatey cream and a slightly different colour in the cake sponge because of the ginger these muffins quickly grabbed the attention. They smelled like a gentle gingerbread house, perhaps more a traditional ginger cake and as moist and bouncy as one too, and worked well with a warming cup of green tea on a chilly winter evening. They were just as delightful to eat as they were to smell and admire. The sponge was well cooked, kept bounce and had a wonderful warming hint of ginger that worked well with the cream running through the middle of the muffin without anything becoming overbearing or blending into one flavour. Whilst the flavours were not enough to stand up and whack you in the face they were enough to make this cake rich enough that the idea of more than one, after eating one, would leave you sadly shaking your head. They are certainly delightful to eat and would be fantastic to make into on the go bites but to eat more than one would be quite a feat. If you ever get the tram that goes through Addiscombe, Croydon you will see a blue painted shop front with large windows. That shop front is home to a local independent cafe called The Tram Stop and it comes highly recommended by people across the borough and beyond. If you do not have time to sit down and enjoy the fantastic service or browse the shelves of their mini library then you can always nip in and get some sweet treat, such as this flapjack, to take away. A flapjack is something that seems so incredibly simple to make as it involves so few ingredients or steps to achieve a basic one but to do a great tasting, well textured and structurally sound exciting flapjack is far more challenging. It should be sweet but there should be something to cut through the sweetness and if there is a way to add a bit of crunch or chew that is different to the softened oats then that is an added bonus. The Tram Stop achieves to add additional flavours and an additional bit of texture to it without overwhelming the basic sense of it being a flapjack. 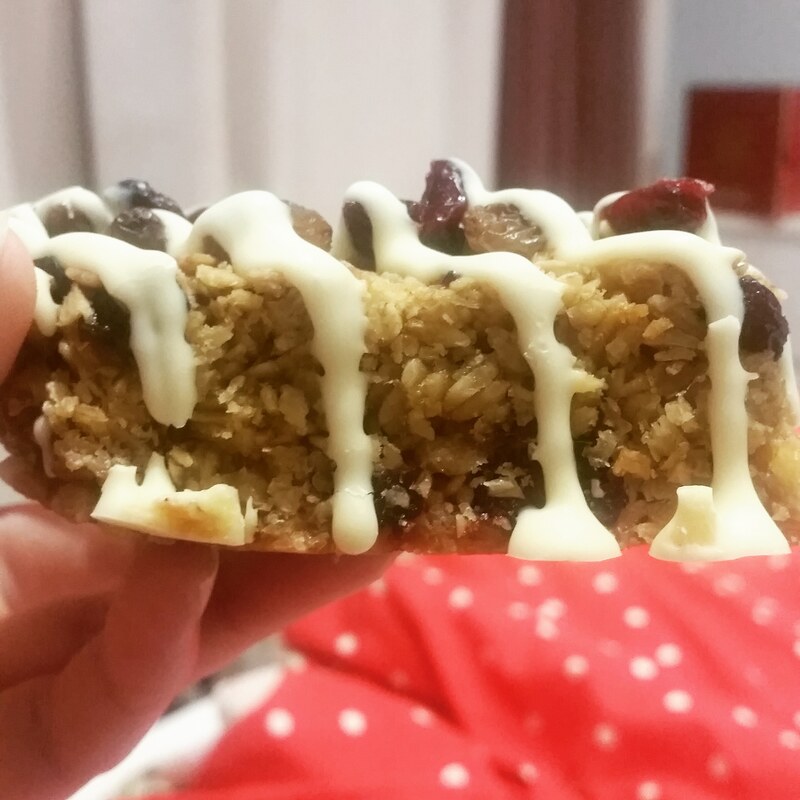 This flapjack was fresh, soft and mildly crumbly as a result of it being loaded with little fruit gems (this is something that is not to be complained about). The fruit gem in the case of this flapjack was cranberry and they provided a little touch of sweet sharpness and added a nice bit of colour into the mix as well. Initially the drizzle over the top may appear to be white chocolate, which would easily risk tipping this over the edge and becoming far too sweet, but it is actually yoghurt which further adds a bit of sharpness and some vanilla flavourings to add an extra bit of depth on the tasting palette. Not only does this help with the tastes but it also adds a little bit of crunch to each bite as well that breaks through and stands apart from the soft gooey oaty mixture underneath it. A delight to eat and a bite of flapjack that is worth grabbing if you happen to be in Addiscombe. If you happen to have more time you could always work your way through a number of items or go for a larger meal whilst reading a chapter or two of the books on offer. Everybody knows not to expect a miracle here. 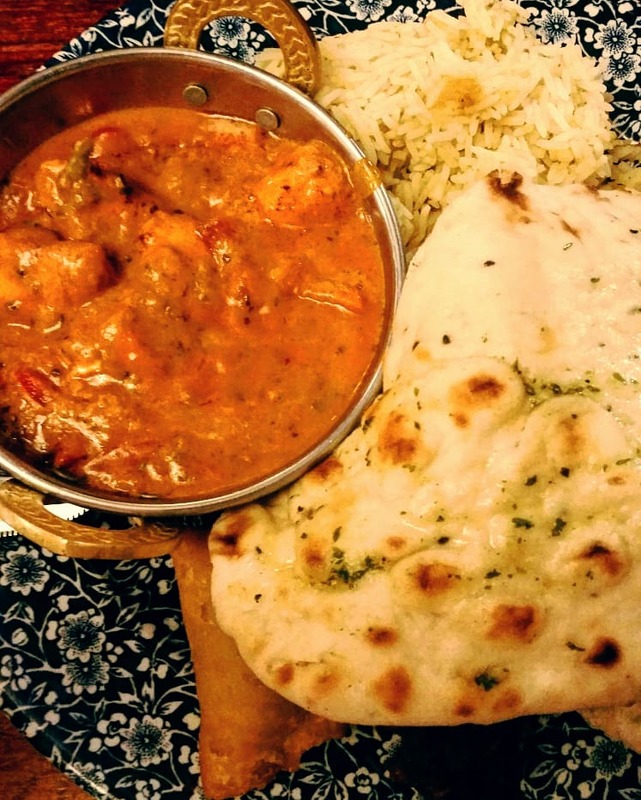 A curry from Wetherspoons is not going to be jammed with spices and carefully balanced or cooked carefully for hours to ensure that the meat is tender and the sauce is naturally thickened to a beautiful spoonful but it does have its qualities. Sure the chicken has been fried off in oil and that has not been drained for long enough before going into the sauce so there is a little bit of noticeable oil on the top but unusually this is well contained and easy to move around. There is a good amount of chicken inside the curry and there are flavours present. It is certainly not spicy and does not seem worthy of one chilli on the scale of heat on their menus but it still provides something comforting and enjoyable for what it is. If you want a good curry you know not to go to Wetherspoons. The rice though is soft and fluffy whilst still having a little bite to it that allows it to work well against the sauce of the curry. The garlic naan is rather lacking in the garlic department but it does add a little bit of extra flavour that again, because of the mildness of the clear flavours in the curry, works well. Of all the pieces on the plate the onion bhaji and vegetable samosa are packed with the most flavour and texture interest and really help to give the dish a much needed added lift. The poppadoms were good too but then… have you ever had a bad one? it is not a remarkable dish, far from it, but sometimes a dish just needs to be simple and edible with some sort of sense in the back of your mind of “comfort food”. Quick cooked curry, at least in the Cooking Up A Treat household, are never exceptional so this is no worse than a usual attempt but it serves its purpose and at the time brought a big smile to the face. A stir fry, especially when you have a bag of ready to go stir fry vegetables, can be done within fifteen minutes. That is just enough time to heat your oven up and put some falafel onto a baking tray to gently crisp up. There are ways to do a super healthy stir fry but this is not one of them; dried egg noodles, a pre-packaged sauce and there could easily be more vegetables packed in there but compared to something from your average takeaway spot it manages to be a lot healthier. In fact a vegetable stir fry, especially with the store purchased prawn crackers, would be plenty to make a whole meal but sometimes an added bit of substance can be welcomed. Something like chicken or pork could easily have gone amongst the stir fry but instead a meat-free option was opted for with some discounted falafel from Cauldron Foods. Eight falafel in a pack that you still need to reheat should never be bought for £2. 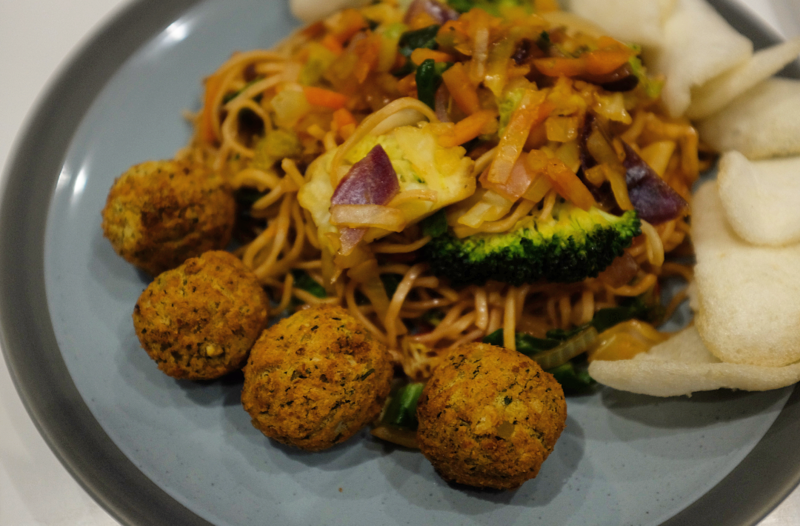 Falafel is not something that the Cooking Up A Treat household would usually opt for, given the presence of allergies that cause queasiness at chickpeas, but given the small quantity and the discounted price they were well worth trying out to see what they were like. The flavours were present but mild and the texture was soft but still had little bits of bite, especially when combined with the outer coating, to make these decent enough falafel. There have certainly being far worse falafel eaten in the past but there have also been ones with an added depth of flavour. These could easily fit into an evening meal or form part of a wrap at lunchtime but given the price and quantity you get in a single pack from Cauldron Foods it is hard to recommend them. What have you had to eat recently that you would give an honourable mention in conversation? This entry was posted in Food and Drink, Product Reviews and tagged addiscombe, branded, brands, cake, cranberries, croydon, dessert, eat, eating, fakeaway, falafel, flapjack, food, food blog, food blogger, food bloggers, food review, food thoughts, gingerbread, lblog, lblogger, lbloggers, life, Lifestyle, lifestyle blog, lifestyle blogger, lifestyle bloggers, meat, muffin, product review, pudding, Stir-Fry, sweet treat, taste, tasting, treat, vegetarian. Bookmark the permalink.